Whether you are a runner who wants to get the most out of training and races, or a fitness newbie who wants to jumpstart her healthy journey, there’s a spot for you at Alexander FITCamp NYC. Developed by former Nike Athlete and running coach Roy Alexander, FIT, which stands for Functional Intelligent Training, works muscle groups systematically so students can improve balance, build strength, agility and endurance, and prevent injury. Through science-based methods, this indoor/outdoor strength and cardio boot camp helps clients achieve fitter, leaner, healthier, and stronger bodies. Why We Love It: This is not a boot camp for people who want to just go through the motions! Roy Alexander’s twenty plus years of training experience come through in these small group classes. He keeps a close eye on form and intensity – so no cheating your way through an exercise! –and works with each student to create and meet realistic training goals. Why It's So Effective: Through a mix of HIIT training, targeted strength and toning moves, and agility drills, Alexander FITCamp NYC helps you burn calories not only during class, but afterwards as well. Thanks to EPOC (excessive post-exercise oxygen consumption) that results from FITCamp’s high intensity workouts, your body continues to burn more calories even when it is completely resting. 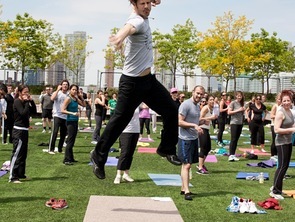 Know Before You Go: For outdoor classes, bring a mat or towel. In the rare occasion that a class is cancelled due to weather, changes to the schedule will be posted on the website at least one hour prior to class. Don't Miss: Keep your inspiration level and health education up in between classes by checking out Roy Alexander’s blog. The fitness guru covers topics including nutrition, fitness trends, and fitness motivation in his regular posts. Added Bonus: This boot camp takes active steps to keep clients injury free and on the road longer. FitCampNYC incorporates prehab exercises to prevent injuries that necessitate rehab and physical therapy.